I have never been a cake maker, apart from the odd chocolate torte for pudding. However, when to my surprise and delight I found myself planning my wedding in June, and someone suggested that I should make my own wedding cake, I took up the challenge. The last fruit cake I had made was from a reduced Waitrose Delia kit after Christmas, and before then it must have been about 1975, so it was not plain sailing. After much discussion and dithering I finally made a 10 inch square fruit cake - again a Delia recipe. The quantities were huge and I had to mix everything together in a washing up bowl. It turned out rather well and I fed it with brandy and stored it for a couple of months. I didn't have the courage to try and decorate it myself but fortunately a friend, whom I had first met on a food forum and lives fairly locally, just happens to be a professional cake maker and offered to do it for me. 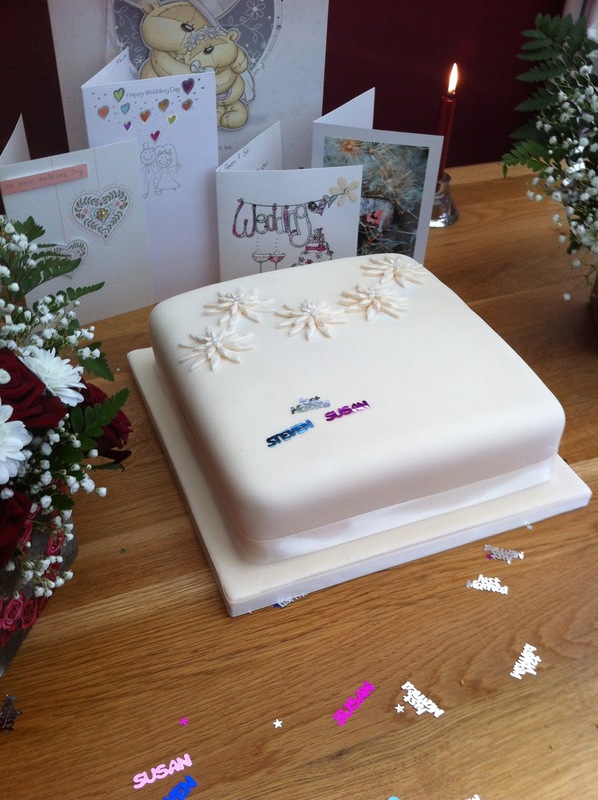 Many thanks to Tracy who is Enchantment Designer Cakes. In August it was my mother's 80th birthday and, as I now had several cake tins (due to dithering over what size wedding cake to make), I decided to have a go at making a birthday cake. The one I chose was Lorraine Pascale's I Cant Believe You Made That cake, but my friend Sue L suggested a more interesting cake mix so I used this one from Dan Lepard. I bought the chocolate cigarillos and pearls on line and was very pleased when they arrived intact. I bought milk and plain and alternated them around the cake, fixed on with a simple chocolate ganache. I was very pleased with the end result - and it really was easy to make. And it looked even better when the restaurant served it with cream and ice cream. I then got a bit carried away when it came to planning for Christmas. My parents asked me to make them a cake, and then I saw a recipe for 4" cakes and I have two 4"" cake tins, but the mixture also gave enough for a 6" cake, so I made one of those as well. This time I had a go at decorating them and I am amazed at how well they turned out. The fruit topped one I gave to my parents, and a friend at work swapped the 4" holly cake for a bottle of Chateau Neuf du Pape - win! 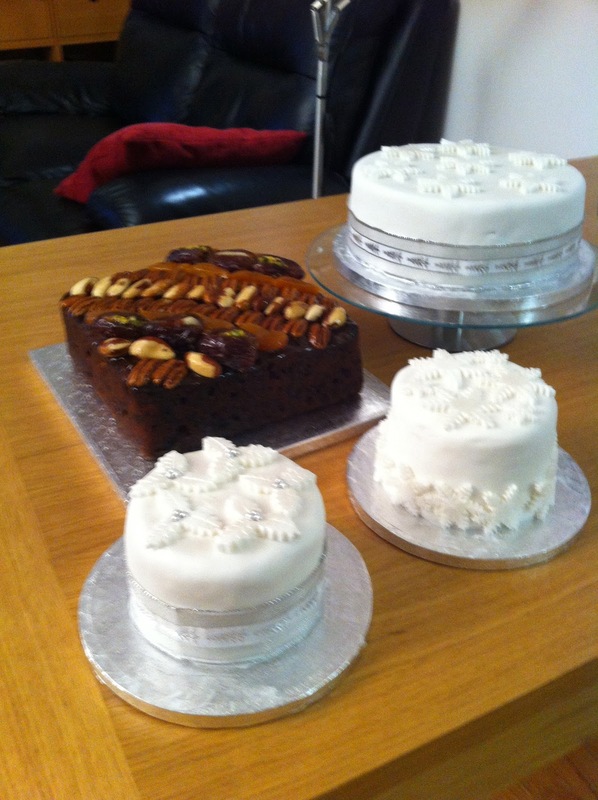 The other two cakes are sat in the office: I admire them daily but need to decide what to do with them.